The Tennessee Titans return veteran starting inside linebackers Avery Williamson and Wesley Woodyard this season, but that shouldn’t stop them from trying to find an upgrade at the position in the draft. Williamson, who’s entering the final year of his rookie contract, ranked 41st among qualified linebackers with a PFF grade of 76.5 last season, while Woodyard’s grade of 79.5 was 29th. Although both players graded 21st or better in run defense, their coverage grades ranked 51st or worse among qualified linebackers. Alabama’s Reuben Foster is a three-down linebacker who showed prowess as a run defender and in coverage in 2016. He was PFF’s top-graded linebacker at 93.9 last season, and his 16.3 run-stop percentage was the top at his position. In addition, his coverage grade of 86.5 was among the best in this year’s class of linebackers. 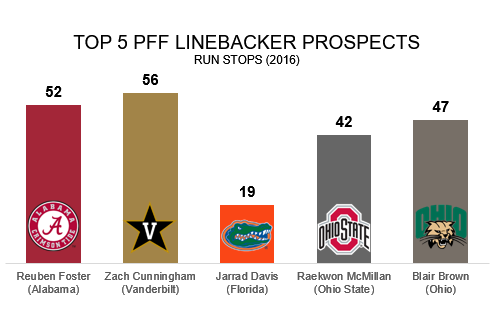 Vanderbilt’s Zach Cunningham’s run-stop percentage of 14.7 ranked fourth at his position this past season. Ohio’s Blair Brown had a PFF grade of 92.4 last season, the second-highest for his position. He led this year’s linebacker class in in tackling efficiency (44.7) and was third in run-stop percentage (15.5). Other top inside linebackers in this year’s class include Florida’s Jarrad Davis (78.7 PFF grade in 2016) and Ohio State’s Raekwon McMillan (85.2).